Noah Hawley’s edgy and absorbing 2016 novel tells the story of a private plane full of rich passengers that crashes off the coast of Martha’s Vineyard and the media frenzy that follows. The tale is less concerned with what happens – revealed very early on – than why it happened and who is at fault. 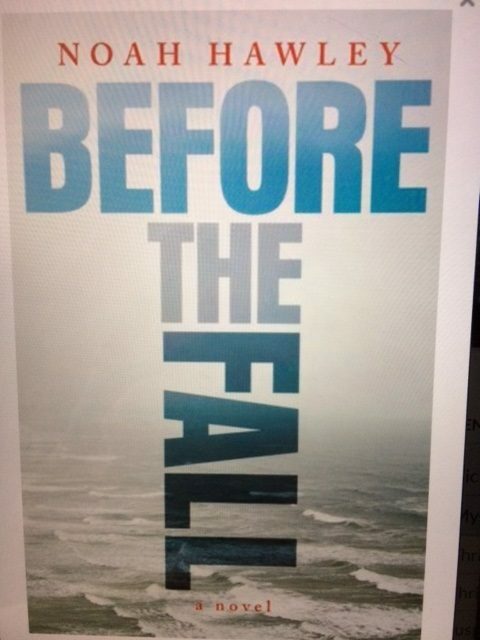 His latest page-turner, “Before the Fall,” not only twists its way along a mysterious and suspenseful path, both in time and place, it also touches on some big themes. These include the value of art, the power of positive thinking, and, perhaps my favorite, the dangers wrought by sloppy or pernicious journalists using the latest tragedy to make a buck and/or shape the “truth” (here, coincidentally I’m sure, holding a striking resemblance to those on a certain popular, American, right-wing cable “news” station). I happened to be in Atlanta on July 27, 1996, when a retired police officer named Richard Jewell found a backpack with three pipe bombs at Centennial Olympic Park during the Atlanta Summer Games. Jewell then risked his life helping evacuate bystanders from the park, only to be falsely accused of planting the bombs there himself. Eventually, he was exonerated by the FBI for a crime he didn’t commit, but not before local, national, and international media outlets shredded his life like a school of famished sharks in that water off Martha’s Vineyard, turning a rightful hero into a notorious villain. “Before the Fall” provides a stark reminder of the damage powerful people can do to those less protected, especially when unleashed on an unwitting public. Plus, it’s a damn good read! Would like to read this book now and will check it out of the library this weekend if available, thanks to your fine suggestion. The popular TV serial drama, which concluded not that long ago, The Making of a Murderer, captures much of the nuances and sophistication surrounding those less protected in a system by those who can manipulate it from the inside out. Did you see this series yourself? It’s intriguing, riveting, compelling, sad, real and raw. The gals that put it together deserve an award for Humanity. It’s a series also about the role media can play in forming public opinion. This relates to two common themes of the dayp: Post-Truth and Fake News. Luke, thanks for the comment, and sorry about the slow reply; I’m just back from vacation and a brief pause from technology, which was quite refreshing! Thanks, too, for the TV recommendation. I’ve yet to see “The Making of a Murder,” but it is on my watch list — I’ve just been concerned the subject matter will piss me off when I watch it! I also tend to watch fictional shows over documentaries, but it’s a new year, so why not make a change? Unfortunately he died in 2007 of complications of diabetes. Even after being cleared, Mr. Jewell said he never felt he could outrun his notoriety. He sued several major news media outlets and won settlements from NBC and CNN. His libel case against his primary nemesis, Cox Enterprises, the Atlanta newspaper’s parent company, wound through the courts for a decade without resolution, though much of it was dismissed along the way. John, thanks for your comment and BIG apology for my late reply; I’m just back from vacation, including a brief break from technology! Your reply points to a growing trend I find extremely dangerous: the media’s need to be fast rather than factual. As a former journalist, I’m constantly amazed — and alarmed — by how the media, and especially TV media, often feels compelled to get the story out there as quickly as possible, and then apologize later if they get it wrong. The rise and speed of social media, coupled with a simultaneous decrease in field-based news correspondents, is partly to blame for this phenomenon, but it in no way excuses media outlets from not fully checking their facts before they go to print or on air. I remember one incident, while working a few years ago in the public affairs office at the U.S. Embassy in Kabul, when a plane crashed in another part of Afghanistan. While I was in contact with our officer near the site to gather information about what had just happened, major cable news outlets all of a sudden started broadcasting in a very sensationalist manner — screaming headlines in bold black letters on bright red backgrounds — about this tragedy, citing specific number of casualties. I asked the officer if what I was seeing on TV was correct, and he said something like: “Nope, no way. No one can get near that crash yet to verify casualties. They’re just making it up.” And sure enough, he was right and the media got it wrong, lamely apologizing later, but not after others had picked up and run with their erroneous reports. In August, I wrote a blog titled “Too Much ‘Terrorism,’ ” in which I noted another troubling trend of the media, plus of world leaders and many others, who immediate jump to the conclusion, or at least imply, that almost any act of violence these days is “terrorism.” Doing so denigrates the very meaning of “terrorism,” which has a specific definition and consequences for real perpetrators of the act. It also is akin to “crying wolf,” which, as we all know, is a risky road to follow. Likewise, as you point out, rushing to judgement before the facts are collected can and does have ruinous effects, sometimes even on our heroes.